A Herbal Extract formulation which increases immunity of plants to fight against Phycomycetes Fungi like Downy Mildew, Late Blight, Quick Wilt, Root Rot etc. 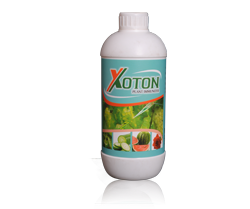 Xoton can be sprayed on follage or can be given through drip irrigation. Don’t Mix with Calixin , Bordo Mixture , Sulphur or copper based products.